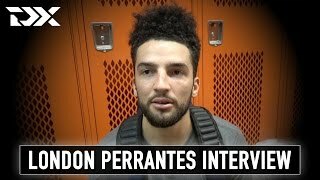 -London Perrantes came into the PIT looking to show he can excel running a team in a different style of offense than what NBA scouts saw at Virginia, and did a very nice job. He led the tournament in assists, at 8.7 per game, made 43% of his 3-pointers, and played outstanding defense as usual. Perrantes isn't blessed with great size or length, at 6'0 ¾ without shoes, with a 6'3 wingspan, but he has a strong 200 pound frame and has superior overall measurements to those of Fred VanVleet (5'11 without shoes, 6'2 wingspan, 195 pounds) so his dimensions certainly aren't a deal-breaker. NBA teams expressed optimism about Perrantes' ability to carve out a niche, even if he will likely have to do it in a similar fashion to VanVleet.